Friday night’s “Havoc” fight card came with heavy anticipation as many believed it could have been Holly Holm’s last fight in front of a local crowd before her assumed move to the UFC ranks. While that isn’t the case, a Holm fight card typically brings immense buzz to the area and the New Mexico combat sport star is easily the state’s biggest draw in terms of popularity and ticket sales. The fight didn’t deliver the emphatic knockout many believed they’d witness on Friday night but the fight did have several exciting moments. Praise should be sent towards Angela Hayes as she absorbed some of the best stuff Holm had to offer and kept standing. The rest of the card delivered as well and overall, the Fresquez Productions fight event was a success inside the Route 66 Casino & Hotel. I don’t have official stats and this is an assumption but I comfortably believe that Holly Holm has the highest percentage of leg and body kicks landed by any women mixed martial artists and I would even venture into the assumption that her percentage is the best of any fighter regardless of gender. I don’t see her miss often and she is very patient in her strike selection. Some brutal knees from Cody East softened up Esteves Jones and big punches got the TKO victory. There are other women in WMMA that have kickboxing experience and even kickboxing world titles but I have yet to see anyone work such a versatile kicking arsenal as Holm. She attacks in all sorts of angles and being a southpaw makes it very tricky to find counters to her heavy kicks that hit the legs, body and head. Next up, Holm gets Julianna Werner (7-3) who is another grappling specialist. While she is the toughest test to date for Holm, she offers the same challenge as Hayes did in that Holm needs to use her exceptional footwork and spacing to work at a comfortable distance. It looked as if Angela Hayes had Holm in trouble with a leg-lock but in round three the ladies may have been too sweaty to allow Hayes a good grip. I would be interested to see if Werner can catch Holm on the ground earlier in the fight. This also ends talk of Holm going to the UFC. Promoter Lenny Fresquez disclosed his desire for a six-figure contract from the UFC which would in an estimated-guess, put Holm being higher paid than top contender Meisha Tate who makes 28-thousand base pay. I doubt the UFC will pay that for Holm, who has yet to face a UFC-caliber foe and has yet to draw interest from fans outside of New Mexico and Texas. Cody East has a lot of hype surrounding him. He has been perfect in Boxing and MMA this year and seems to improve in every outing. East is the King of the Cage Champion and as a Heavyweight, the pathway to the UFC is generally faster than other weight classes. His power and hand speed were impressive and when he smelled blood, he swarmed a hurt Esteves Jones and finished the fight. Referee Robert Romero’s performance in this bout needs to be brought into light. East and Jones are big-time Heavyweights and it is well-known that these big men hit each other very hard. East unloaded some powerful shots to a defenseless Jones before the stoppage and there were at least 8-12 shots that were extremely excessive. For fighter safety sake I hope that these kind of stoppages don’t happen often or else someone will eventually get hurt. Gabriel “Moggly” Benitez is primed and ready for the UFC. 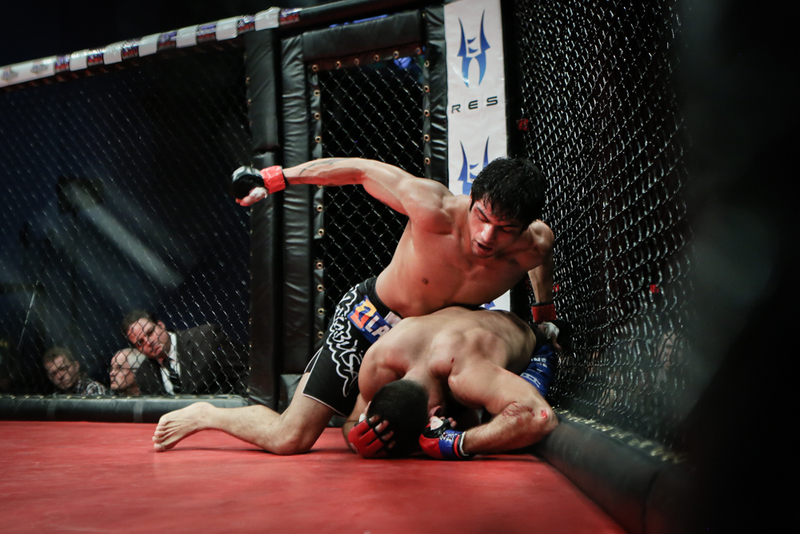 After a setback at the last Jackson’s MMA Series event, Benitez needed a win to cement his place in the UFC’s first event in Mexico. He will now take that step into the big leagues as arguably the best unsigned Mexican prospect headed to the big show. Rey Trujillo showed his toughness in the bout but “Moggly” is on another level than regional fighters at 145 or 155-pounds. His clinch work is absolutely lethal and his technical striking will be a handful for a lot of opponents going forward. The Jackson-Winkeljohn product Chuck Pieritz is now 4-0 and adds Cris Leyva to his resume, who himself is a very experience veteran of New Mexico MMA. The win is big for Pieritz as it gets him some name recognition and showcased his high level wrestling skills. Interested in seeing him fight again in his natural weight class of 145 or 155-pounds instead of 170-pounds. Nick Urso is the real deal. Many readers may remember I picked him to lose in the finals of a dream tournament between four of New Mexico’s best Flyweights. I may have to reconsider that decision. Urso unloaded a brutal hook that floored opponent Jesus Urbina and he followed up with some powerful ground and pound. I would be surprised if the UFC waited more than one more fight before signing this elite type talent coming from the Floridq native. “Moggly” Benitez worked a crushing clinch game en route to an impressive stoppage over Rey Trujillo. Many in attendance believed that the stoppage was early and once again Referee Robert Romero was overseeing the bout. I think it was a good stoppage and I was very disappointed in Urbina and the crowd for their antics. 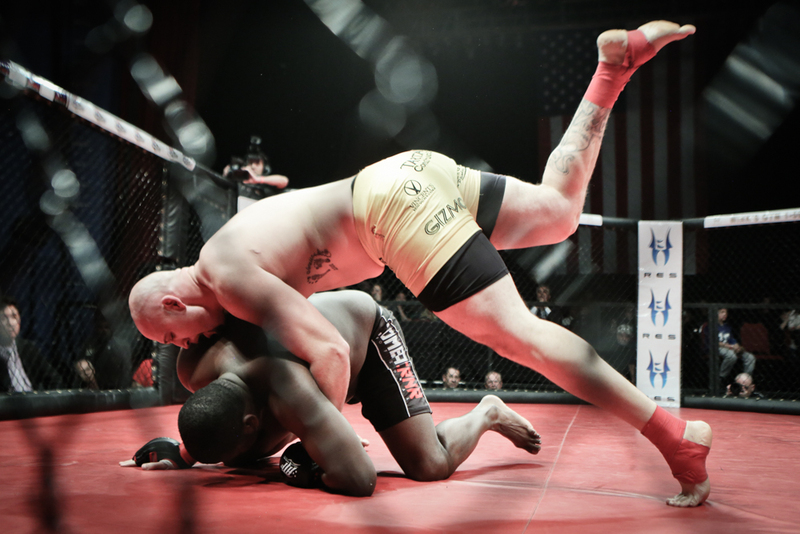 The biggest concern inside the cage is fighter safety and to stop the fight is a split-second decision; extra blows to the head of a concussed fighter can lead to major injury issues. As fans we can’t be bloodthirsty for violence, we have to understand that the fighters are always at risk and appreciate the judgment of our referees even if we don’t always agree. We didn’t see much from Clint Roberts but what we did see was amazing. The flying knee that busted up Eddie Gamboa’s nose was beautiful. It was great to see Roberts pick up a win after battling injuries. That knee was well-timed and it looks like Roberts was fluid and smooth in his delivery. The reason for a doctor stoppage on a badly broken nose needs clarification to many. The nose is a ligament closely tied to the sinus and brain cavities. To have the septum or ligaments dangling in the extremities is a hazard that can be very dangerous. A broken nose that is impacted can start puncturing into the sinus cavity which could cause lots of problems, worst of all brain issues. It can in some cases breach the brain cavity which can lead to death. Chances are Gamboa’s nose wouldn’t have ended up that bad but the precaution taken in the stoppage was completely necessary. Jerome Rivera is a budding star in the making. The Santa Fe and Rio Rancho trained teenager is now 4-0 as an amateur and has finished every fight emphatically in the first round. He has dominant grappling talents and unleashes ground and pound with poise and selective ill-intent similar to that of a seasoned professional. His win over Ricky Esquibel goes on to solidify Rivera’s 2013 resume for “Amateur Of The Year”. The Route 66 Casino wasn’t sold out but it had an awesome turn-out. By the time the last three main fights started it looked as if at least 80% of the venue was filled. It is very difficult to draw a sellout in this economy and poor state of local MMA but “Havoc” arguably sold the best of any 2013 show other than Bellator 91 back in February.